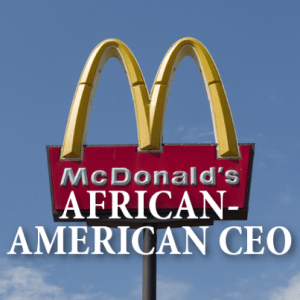 CBS Sunday Morning’s Lee Cowan shared a rare interview with McDonald’s CEO Don Thompson, who is optimistic about the company’s prospects, in spite of declining sales. Cameras followed him on a visit to an Oak Brook, Illinois location, where he interacted with the hourly workers who keep the company running. He said that the company has 35,000 restaurants, making it a big target from competition and detractors. 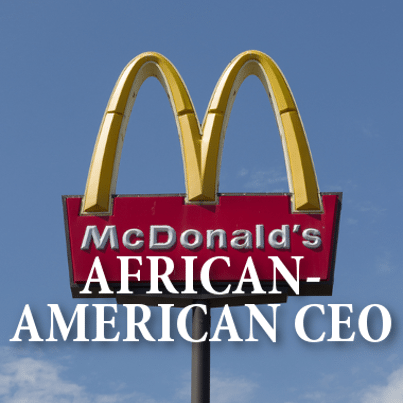 Two years ago, Thompson became the company’s first African-American CEO. In a recent survey, customers ranked it as the industry’s worst-tasting burger, while sales are on the decline thanks to increased competition from companies like Chipotle and even Taco Bell. Thompson grew up near Chicago’s Cabrini-Green housing project. He remembered walking by the sole McDonald’s near them, though dining out was a luxury. Thompson’s wife Liz grew up nearby; the couple has been married 26 years. They met as engineering students at Purdue University. The couple took Sunday Morning back to the area where they grew up, and Liz had positive memories of her humble beginnings. Don Thompson began as an engineer at McDonald’s 24 years ago, before heading to business school. He credited the company with emphasizing the product and store operations at every level of management. These days, he’s earning more than $9 million. Even that is a target as protesters are staging picket lines to raise the minimum wage to $15 per hour. He said he understands and admires the desire of the protesters to provide more for their families. He has told President Barack Obama he would support raising the minimum wage, if increases were phased in over time. Meanwhile, he hopes that hourly employees will continue to invest back in the company. He noted that 60% of current franchisees started as employees. Thompson and McDonald’s are also fighting the perception that fast food is junk food. That is a criticism with which McDonald’s executive chef Dan Coudreaut, who sees nothing wrong with the company’s menu. His resume also includes Four Seasons hotels. Coudreaut is the mastermind behind the company’s healthy breakfast menu, including an Egg White Delight McMuffin. About 2,000 menu ideas are developed annually in the test kitchen for the company. Thompson feels strongly that he has done more than anyone else to expand the breadth of healthier options, such as milk and fruit, on the company’s restaurant menu. That is a message he hopes will spread via social media. There, you will find the company responding candidly to some of its biggest critics. McDonald’s recruited former MythBusters host Grant Imahara, a skeptic of the fast food chain, to explore the answers to tough and sometimes gross questions from critical consumers, only to find out that the company says it does not use pink slime in its food, for example. Liz said it’s tough when people come after her husband, because she knows a side of him that strangers wouldn’t. Thompson presides over an empire, but instead he sees himself as a guy who worked his way up. He believes that everyone from his restaurants can have a fulfilling time with the company if they enjoy what they do.